Imagine you are the leader of a team of developers creating a new mobile game. The team has worked well together, but recently you’ve noticed that two of the senior members are butting heads. Today, they are really getting into it, arguing in front of the rest of the team. You can tell that this is having an impact on the morale and effectiveness of the team. Meet with both of them and tell them how they can resolve their conflict and make sure they do it? Speak with them separately about the problem, and then get them together to discuss it. Encourage them to work better together and support their attempts at improving collaboration? Talk to them separately to get their thoughts, then bring them together and show them how to work out the conflict between their ideas? Tell them you are concerned about the problem and the impact of it on the team, but give them time to work it out by themselves? Which is the best answer? It depends on the team. Teams have different levels of maturity that must be matched with a leadership style best suited to it. By “maturity”, I don’t mean how grown-up they act; we game developers don’t usually care much about that. In this context, maturity means the skills the team applies to work out problems among themselves and their performance as a team. We want teams with high levels of maturity because they are more effective and enjoy working together the most. This is where situational leadership comes in. 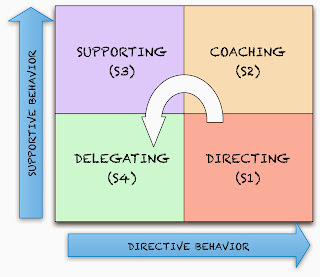 Directing - A leader defines roles and tasks for developers and the team. Coaching - A leader still sets the direction for the team, but coaches the team in the how roles and tasks are determined. Allows the team more freedom in tracking their work. Supporting - A leader allows the team to make decisions about roles and tasks, but still shares in decision-making and progress monitoring. 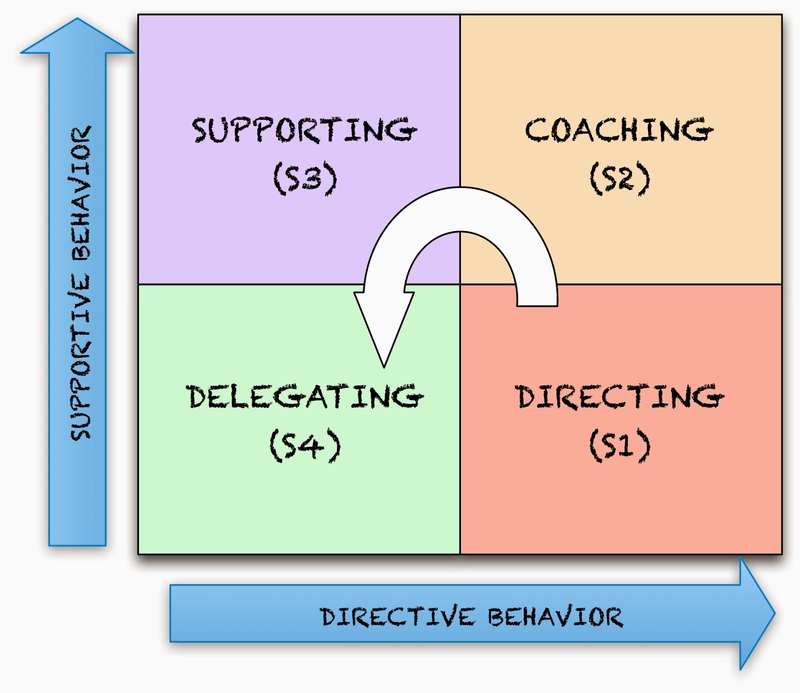 Delegating - A leader is involved in decision making and progress monitoring, but the team is fully self-organizing in their roles, practices and work. This is just a model, not reality, but it is an effective model to help guide leaders to apply different standards to different teams, just as a parent applies different parenting principles to a teenager than they do a toddler; at least I wish my parents had. Take a look at the answers to the question raised above and see how each of them might apply to teams at different maturity levels. A newly formed team will most likely need the directing (S1) category applied, while others that have been together longer and are working well can have later categories applied. The challenges to this are identifying the maturity level of the team, including what model to use, and coaching teams to reach higher levels of maturity. Future articles will address those topics.